From the cover’s buttery suede texture and gorgeous art (Gustav Klimt’s The Three Ages of Women, 1905) to the vivid imagery and poignant themes inside, this collection has easily earned the right to be called Gold and is worthy of a gold-star review. 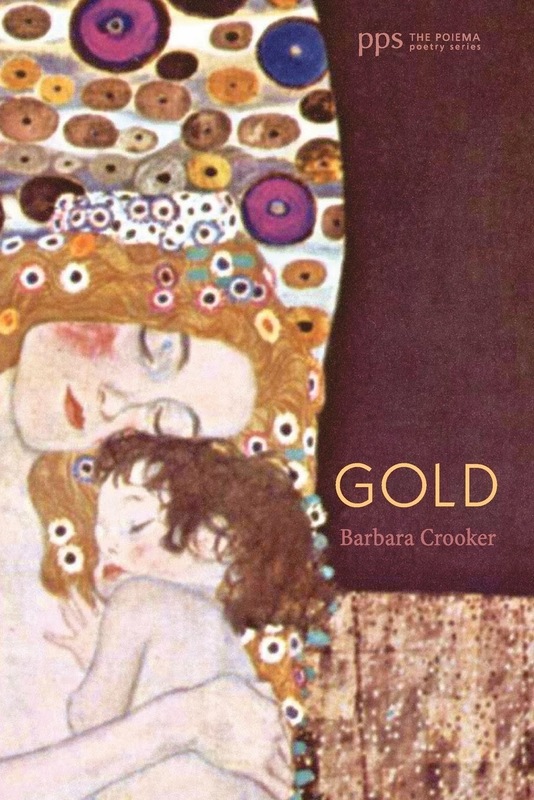 In poems that speak to natural elements and changing seasons, to a mother’s illness and death, to food and its soothing effects, to childhood memories and fairy tales, and a writer’s response to visual art, Barbara Crooker paints an intricately layered collage with a vibrancy that reaches all the senses and touches an array of emotions as well. Some poems are stippled, some carry the oily mark of a heavy edge of a painter’s knife, many feel like the soothing colors of a watercolor while just as many are Jackson Pollacked with the rich tones of fall – garnet, gold, yellow. the frost moon, the loss moon, sinking below the horizon. into it, sugar would melt on my tongue. This poem is one of my favorites in the whole collection, probably because it hits close to home for me. My cousins and I used to play marathon rounds of Monopoly and Life. My paternal great-grandparents emigrated from Italy, and my Irish grandparents were always stretching food to feed their family of 10. Drops of color drip from the tip of Crooker’s paintbrush throughout the collection creating movement and life in her work. Sometimes she names the colors – gold, garnet, cerulean; in other places she shows us goldenrod, the fuchsias and black-eyed susans, the redbud trees (“the pluperfect of purple”), dandelion “parachutes”, a bevy of birds, the tomatoes, mozzarella and “dark splash of balsamic,” October, grass, pistachios, and zucchini. The presence of these strong, colorful images among many others tells the story of the changeover of seasons in nature and in life. Many of Crooker’s poems seem so effortless, so easy in how their words play together and tumble over one another to their natural endings; their compositions well-executed and fully realized. However, poems that seem effortless are the ones that require the most work on the part of the poet. And since this collection is teeming with them, it leads the reader to an understanding of the talent and dedication of an author who has studied and practiced her craft and is now reaping a rich harvest from a full body of work. I have only given you a glimpse into this masterfully painted collection. For every example I included, there is a bushel or two more in the book. I encourage you to feel the cover in your own hands, study the cover’s painting, and then see Crooker’s vivid imagery jump from the pages, read her carefully selected words that fall exactly where they are meant to be in this collaged collection. Whether you are sitting on a park bench, in your car during your child’s sports practice, or in your favorite chair, you will witness the collection’s artistry unfold each time you turn the page.